Have you ever set off your fire alarm while cooking? More often than not, when I’m making pizza, I’ll be rewarded with the high pitched beep of the fire alarm. It’s not that the pizza burns or anything is actually smoking, but for some reason, every. single. time. I make pizza, I know I’m going to get a one minute workout while I hop up and down underneath the smoke alarm, waving a kitchen towel like a madwoman. Apparently, last night I set off the fire alarm one too many times. The fire alarm’s battery is dead and now, like some starved baby bird, it won’t stop chirping at me. I think (okay, fine, I know) the noise is letting me know the alarm needs a replacement battery, but it’s 11:30 at night. How is it that the alarm can even make noise when it doesn’t have a battery?! The incessant chirping was worth it though: this pizza was so, so, good. 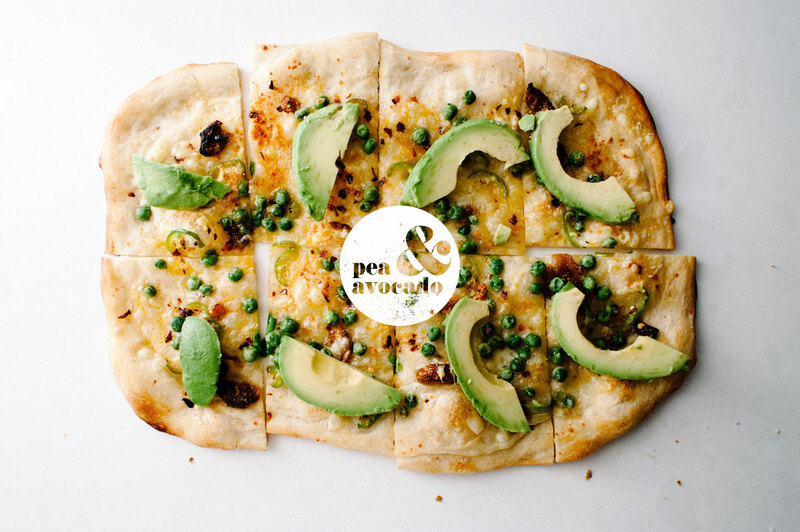 The pop of the peas, the sweet richness of roasted garlic, the creaminess of the avocado and the freshness of the lemon zest made this one tasty creation. Oh, and the beeping eventually got to me. I went out for a battery – thank goodness for the 24 hour Walmart! 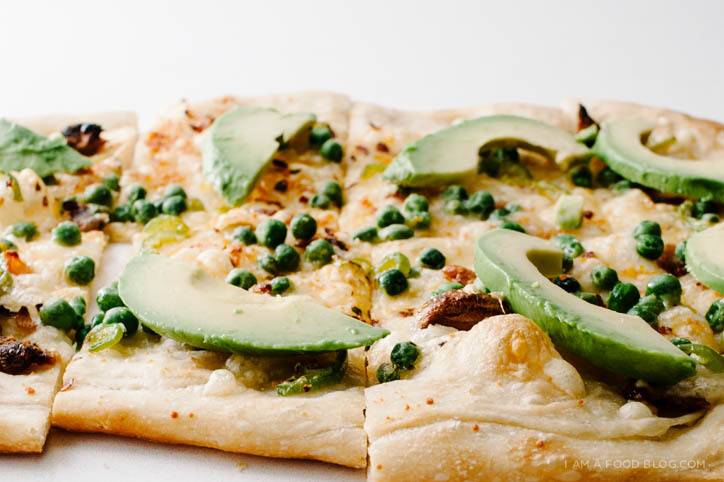 i am green, i am creamy: i am pea and avocado pizza! Arrange a rack in middle of oven and preheat to its hottest setting, 500°F–550°F. Gently shape dough into a rectangle on an oiled baking sheet. 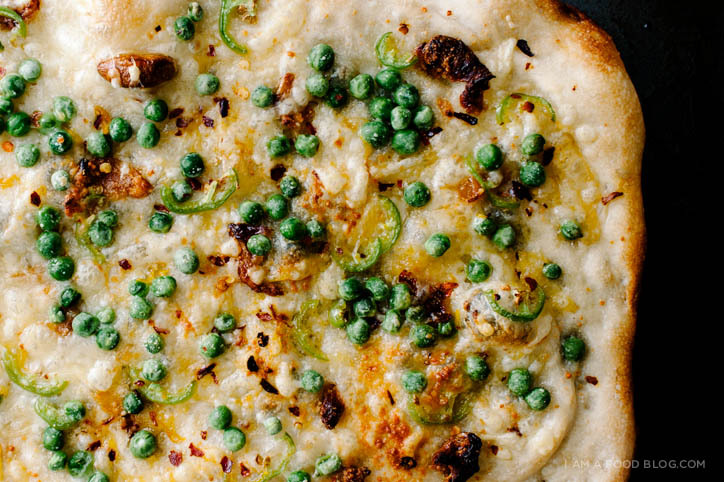 Top the pizza in the following order: shredded mozzarella, roasted garlic, peas, jalapeños, a sprinkle of red pepper flakes and the parmesan. Bake pizza until bottom of crust is crisp and top is blistered, about 12-14 minutes. Finish with the lemon zest and avocado, slice and enjoy! I didn’t realize people made pizza without setting off their fire alarm, oops! Looks amazing, as always! i know right!? i was getting worried about the neighbours…but thankfully no one has said anything….yet. It’s not just you every time I make a pizza (or broil anything) my fire alarm goes off too! I think any little crumbs in your oven start to smoke when the temperature is that high and it just sets it off. And the chirping drives me crazy, I live in an apartment building and for a while whenever it got quite (morning/night) I could hear *someone’s* fire detector chirping but didn’t know who it was. It went on for weeks. Do not know who could live with that for so long. And have never seen a pizza recipe like this before its so interesting and seems like it could easily be made vegan. The only other time I’ve had avo on pizzas is at CPK but I think this would be sooooo much better. And the lemon too, so cool! ooh, i only lasted about an hour and then i was like, that’s it, we’re going to the 24 hour walmart for batteries! yes, the lemon really makes it fresh! 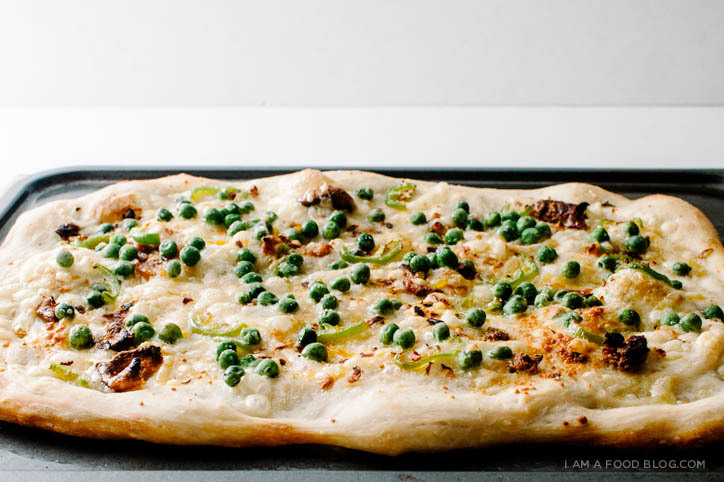 love all the flavors in this pizza – roasted garlic, lemon zest- so great on pizza!!! and yes that alarm can be such a nuisance! been there..
Ohhh Steph — everything about this! Me, too. The kitchen towel, the burning smell even though the food is fine — oh and add in a neurotic, anxious dachshund who freaks out when the alarm goes off so we’ve got alarms AND barking/crying. And that low-battery chip! AHHH! Hateful sound. I love you for this pizza combination! Peas, lemon and creamy avocado? And adding the jalapenos in there — sounds so delicious! you have a DACHSHUND!??! SO CUTE!!! i die. What an awesome pizza, so creative! thank you, thank you matt!! WHY does the battery always die in the middle of the night?? This pizza looks AWESOME! 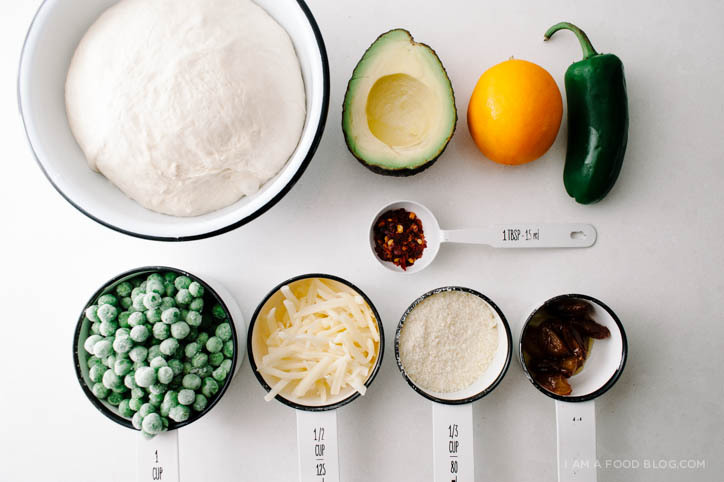 I’ve never had avocado on pizza… but I can’t wait to try! i know. why can’t batteries running out be more polite!??! My goodness. . . pizza needs to happen in my house VERY soon. Love all those summery bright green colors!! Those batteries are the WORST when they start beeping like that. It is kind of funny to think about how they can make noise when the battery is running out if they require a battery to run. . .anyways. . .glad that you were able to fix it! i totally don’t understand where the get the power to beep. i even tried taking the battery out. and it still beeped!! I have recently become a big proponent of artisan pizzas. They are kind of my new sandwich. Quick, creative, delicious, low in calories, uses what’s fresh or what’s loitering in the fridge in bits and pieces. This is a prime example. yes to using all the bits and pieces in the fridge! those kinds of pizza are the best! I’ve had avocado pizza once before in a small place in the hills of Valparaíso, Chile. Thank you for reminding me of that wonderful treat. So many dear memories rushing into my mind right now! Yours looks delicious as well; will definitely give it a try and do my best not to annoy the fire alarm. OMG YESSSSSSSSSSSS I love everything about this!! I was wondering what else you topped this with and roasted garlic GET. OUT. I’m dying. And also dying over how hilarious your post is — why why why is it that fire alarms only make that insane brain-piercing chirping sound at night when the last thing you want to do is go out and replace its batteries? Awful. Sorry that that happened :( But love this pizza beyond words! arg…roasted garlic…why is it SO GOOD!?! The fire alarm always roars when we make pizza….it haaaaates the hot heat from the oven. SO ANNOYING. This pizza looks worth it though. Yum! Wow, this pizza sounds amazing! 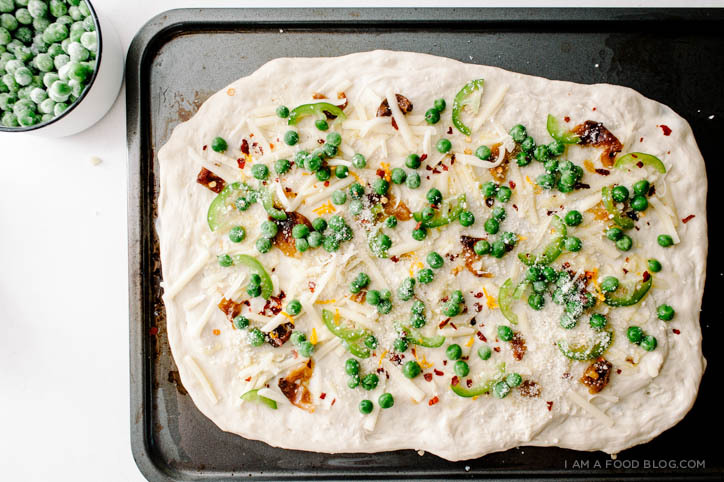 I’ve definitely never had peas in pizza form before–super intriguing. And of course the avocado is such a great, rich contrast. NOM. the coolness richness of the avocado…mmmm…. Aaaaaaaaaaack the fire alarm!! When I lived in NY it would always go off when using the oven…it was delirious – especially when living in a walk up where you could hear what was happening 3 floors above. Major UI/UX phail here. Can you pleaseee do a creamed corn recipe? I am not a huge fan of warm avocado so I love that you put it on after the pizza is done cooking. I’m sure the cool and creamy texture is a nice contrast. hmm, i haven’t tried warm avocado! This pizza looks so good!! So green! That looks delicious, and I will certainly try this at home,after setting off my fire alarm!! That looks great! Love the roasted garlic. You should try falafel pizza…it’s a family fav. Thanks for the new recipe. Thank you for the recipe! I made this pizza yesterday (it was my first homemade pizza) and it turned out delicious! Best pizza we had in a long time :) I made it a little thicker than what you showed on pictures, because I had a little trouble spreading the dough thin enough, but it still was awesome!